TolkienGuide.com - Is there no consistancy in Hardcovers? Is there no consistancy in Hardcovers? I am a new collector and have roughly 6 of the 12 Histories of Middle-Earth and Lord of the Rings, some new, some used. All hardcover. The first two, the BoLTs seem to be shorter and less well made (no fabric glued to the back of the pages and plain cardboard black paperwrapped hardcovers) , while the others, later in the series seem to be taller and better in construction (wrapped in cloth, etc). Is this just the way of it? Or is it actually possible to get a full set? You need to avoid the Book Club Editions (also often sold as 'First American Edition') which are smaller in size and printed on poor quality paper and do not have cloth on the boards. 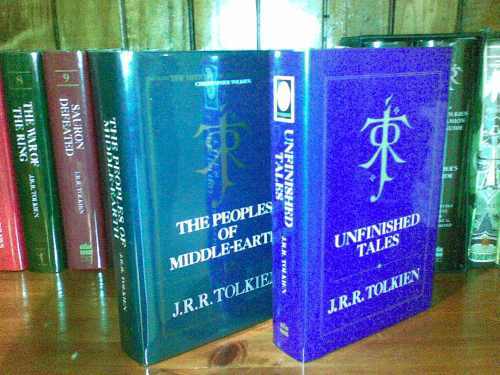 The standard trade hardback editions are all consistent in height (although the dustjackets for Return of the Shadow, Treason of Isengard, War of the Ring and Sauron Defeated are different in style than the other books, having white covers with Alan Lee paintings, rather than the non-illustrated coloured covers that the other books share). I have attached a picture of my US and UK 1sts, so you can see what they look like. I actually got caught out when I purchased my first copy of BoLT1, thinking it was a trade US 1/1 and ended up with a Book Club Edition that was too small. It is still sitting in a box somewhere, but I learned a valuable lesson from that $9.95 purchase, which was to check facts before bidding! The correct US 1/1 BoLT that I got a few weeks later cost me less than $15.00, so these books are not at all expensive if you are prepared to take yor time. From memory, the least I paid was about $10 and the most expensive about $30, and that's all for 1st/1sts. I actually have two-and-a-half sets of UK 1st/1st HoME. The first set was almost exclusively purchased as they were released (they were bought for me by my mother and my grandma each year as Christmas/Birthday presents). From memory, the only ones I was missing as 1st/1sts were BoLT 1 and Peoples (annoyingly, my mother stopped buying them at volume 11 when I moved to the US for a couple of years! :)). The nice thing about that is that I have had 10 of them from new and they were treasured and carefully stored out of damp and sunlight, so are pretty much pefect. From memory, except for 1 and 12, which are unpriced, all the rest are priced (with Bolt 2 having a sticker). Return of the Shadow means the most to me as it was the last gift I got from my Grandma, and I still have the birthday card tucked inside for safe keeping. My second set is a mixture of priced/clipped and unpriced copies. The second copy of Shaping has the Barcode sticker and is price clipped and re-stickered. I think all up I paid 500 pounds or so for that set, but it took me a couple of years. I was also lucky and had a couple of bargains, such as AUD $10 for a copy of BoLT 2 and AUD $40 for War of the Jewels (which is ex-libris, but only has a single tiny blue "Cancelled" stamp on one of the blank end-papers - no pages cut out and the priced jacket was absolutely perfect once I took the plastic cover off it. According to the library card, which fortunately was attached to the plastic, not the book, it had been loaned out twice!). I had a lot of fun chasing these books and the US ones. I have no plans on completing the third set - I expect I will sell/trade them at some point, along with a few 1st/2nds, 1st/3rds, etc that I have kicking around. As an aside, while we are talking about HOME editions, like most people my UK Sauron Defeated has a faded spine. As I now have a full set of UK 1/1sts, I would hate for these to fade like Sauron Defeated, is this the only copy known to have problems with fading or should I store the books completely out of sunlight. (Altho' I don't actually have a copy...) I suspect Jewels might be suseptible to light damage as well. I always ask about sun fading to any jacketed book with red on the spine. Trotter, I would keep any red (or redish) spines out of direct light. I personally don't have any of the HoME on display at present. They're in a glass doored bookcase behind numerous other (less important) books (all doubled up -running out of room!). I think they are also turned spine inwards! What about Children of Hurin, the Silmarrillion, and Unfinished tales. Should they match? Trotter/Khamul - I don't know how many copies of BoLT 1/Return of the Shadow I have seen with a faded spine - the "black" dustjacket fades to a very unlovely shade of purple if exposed to sun too long, so it's probably using some similar red dyes. I do agree that red dustjackets are very susceptible to sunlight fading, but keep them all out of direct sunlight! Even the white dustjackets of the first edition LoTRs get all brown and crackly from sunlight over time. Stu - I wish I had had relatives that "together" when I was growing up, getting me books like that! One cautionary note, your Grandmother's birthday card is probably not acid-free, so you might want to wrap it in archival tissue paper at the very least, or you may end up with a slightly brown ghost-image of the card on the touching pages of the book over time. On your other topic, my best find was a couple of UK Peoples I found in a US specialty bookstore at list price (converted to US$, at that time they were about $50 each), and this was in 2002 or so - they had been sitting on the shelves like that for years. Eric the Red - I am not sitting near my copies of UT and Silmarillion right now, but in general those three books don't match in size, binding materials, etc. Not even the various deluxe/super deluxe editions that HarperCollins has put out over the years match in size or quality, and that's a shame. Eric the Red The British George Allen & Unwin first hardback editions The Silmarillion, Unfinished Tales and The Children of Húrin match the UK History of Middle-Earth Hardbacks in that they are the same height, but no other similarity, which is not surprising given that The Silmarillion was published in 1977 and The Children of Húrin in 2007 (30 years later). The US editions do not match even in size as far as I am aware. I don't know, The Silmarillion & UT are pretty uniform; dyed top page edges and all. And they don't differ markedly from the early GA&U HoME titles either; especially (again) vol. 1 - IV with their dyed top edges. CoH is, as you state, a book that is seperated from these titles by a few decades (& companies!). Of course you could buy uniform copies of all in their new format: the Hx Hobbit format for want of a better description.